As a society we have never been more aware of the impact of our actions; from the food we eat to the cars we drive, our sense of social conscience has never been stronger. Many people are now choosing to take an ethical approach and apply this to how they invest their money. Recent research carried out by Ethex highlighted that 19.5 million people in the UK wanted to get more involved in positive impact investing, but they felt that there wasn’t enough information or relevant products provided to them by traditional financial service providers. The term impact investment is becoming more widely used in by the financial industry and retail investors alike. But what does it mean, and can investors really make a positive social impact with their money? That was the aim of Energise Africa, a joint initiative from Lendahand EU and Ethex, two of Europe’s biggest ethical investment platforms, when it launched in October last year. The vision was to bring UK retail investors the opportunity to invest directly in businesses bringing life-changing solar access to thousands of people living without electricity in sub-Saharan Africa. Just over 6 months on and the initiative has raised over £3 million in funding for 25 projects in rural areas of Africa, with investors earning a potential return of up to 6%. To translate this into actual impact, it means there are 100,000 people that now have access to clean, reliable and affordable solar energy, with an environmental impact of reducing CO2 emissions by 30,000 tonnes. 2016 saw the launch of the UN’s Sustainable Development Goals (SDGs) – essentially the to-do list for people and the planet. Each of the 17 goals and accompanying targets were designed to wipe out poverty, fight inequality and tackle climate change; addressing the needs of people in both developed and developing countries – ensuring that no one is left behind. And all of this by 2030. From the very outset the SDGs were designed to be ambitious and as a consequence the amount of investment needed to realise the SDGs is also ambitions – according to the UN, $3.9 trillion of additional investment per year will be needed, yet current levels amount to just $1.4 trillion. Now, with the evolution of fintech and social investment opportunities, such as the Energise Africa initiative, retail investors have a tremendous opportunity for retail investors to invest for a sustainable future. Investors can begin from just £50 to drive positive change, whilst delivering an investment return that can often be higher than traditional investments or savings accounts. Are you interested in supporting affordable clean energy access for African families? Take a look at the available investments on our website, with potential returns of up to 6%. Capital is at risk and returns are not guaranteed. Increasingly, investors are empowered to assess the social impact they want to have with their money and balance this up with the financial return and risk associated with different products. What’s critical is developing the ability to take these innovative financial approaches and rapidly scale them. By growing the contribution of retail investment alongside the more traditional forms of government, development and private finance we can make available the catalytic capital needed to realise the SDGs, in full and on time. 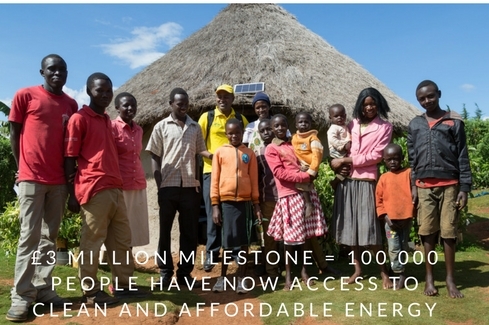 The interest shown in the products offered by Energise Africa and the investments already received, coupled with the initial repayments being received by investors in these products, should be seen as an encouraging step towards achieving the additional funding needed to achieve the global goals on target. Capital is at risk and returns are not guaranteed. Please read the full risk warning on https://www.lendahand.co.uk/risk before deciding to invest.